Preheat oven to 375 degrees. Spread coconut flakes in an even layer on a parchment paper-lined baking sheet. Bake until golden, 5 to 7 minutes; set aside to cool. Using a serrated knife, trim tops of cakes to make level; discard trimmings. Cut each cake into 3 even layers. Place four strips of parchment paper around perimeter of a serving plate or lazy Susan. Place one layer on the cake plate. Brush with about one-fifth of the simple syrup. Spread over 2 cups of filling. Place a second layer on top. Repeat process with the next four layers and top with last remaining layer. Spread top and sides of cake with frosting, keeping in mind you may not need to use all of it. 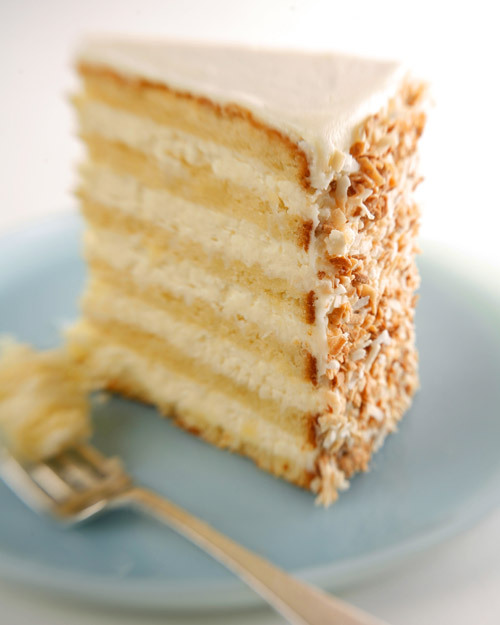 Press toasted coconut into sides of cake; remove parchment paper strips. Chill cake at least 5 hours and up to 5 days. Slice immediately; bring to room temperature before serving.